The Barksdale Air Force Base Air Show and Open House is a two-day annual event drawing just over 100,000 people from the local, regional and national area. Performers from all over the country vie to perform at the bi-annual event, bringing not only their entertainment value, but also notable economic impact of their crews and key personnel. 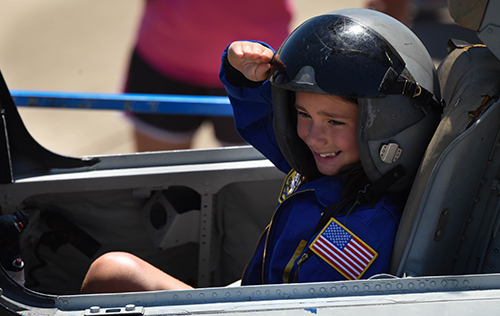 The public gains free public access to the base to tour the military installation, watch the military and aerobatic performances, and engage with both aerobatic performers and military pilots for autographs and hands-on education of aviation. People of all ages are allowed up close and personal access to our country’s fighting air power and vintage warbirds on static display. The show usually features a headlining act, along with other military and aerobatic aircraft and performers. The Barksdale Air Force Base Air Show allows Shreveport-Bossier City the opportunity to showcase the home of the B-52 in a safe environment. This is one of the rare opportunities this governmental entity grants public access to the military installation. The base benefits from valuable PR with the community and visitors to the area. As well, the recruiting arm of our armed forces actively recruits and enlists during the event. The Barksdale Air Force Base Air Show occurs every other year. The next air show will be in 2019. The support and financial commitment of our Corporate Partners and President’s Club Members allows us all to enjoy this exciting entertainment and ensures our success in future years.